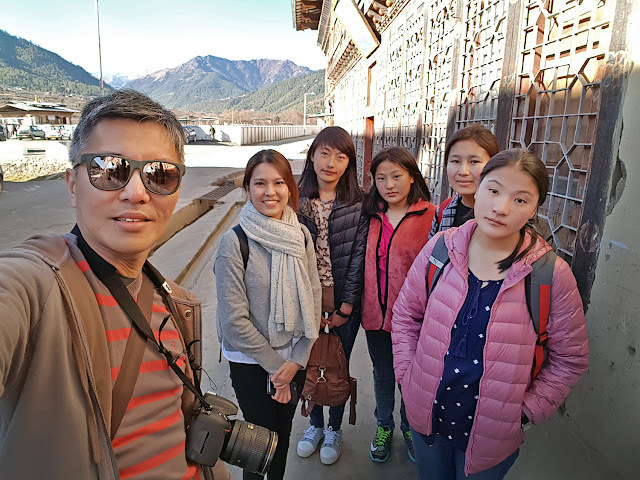 Day five had marked the mid-point of our itinerary, a point that might not be the climax, as everyday should be extraordinary in a place like Bhutan. However, it was definitely the high point of our trip, literally. At 3,988m, Chele La is the highest point one could reach in a vehicle in the country and we were all looking forward (and upward) to it! Mountains of Paro waking up to another beautiful day. We could see the Paro International Airport clearly from the hotel's restaurant verandah on the second floor. It was still quite mind-boggling looking these massive mountains that surround the airport, thinking how pilots have manoeuvred the plane safely onto the short landing strip everyday. A beautiful resident cat in Hotel Tashi Namgay. Stray dogs are aplenty and cats are rare in this country. Snow and ice could be seen on the roadside as we continued to ascend in the comfort of our vehicle. Our fantastic driver, Mr. Sangye, doing his best to ensure a comfortable journey for all despite the challenging road condition. Not forgetting the jokes he would crack to fill the vehicle with laughter along the way. And I had requested to take the front passenger seat to minimise motion sickness. A breath-taking view from 3,988m at Chele La after 1.5 hours of hardship in the vehicle. We shouldn't complain about the rough journey, as we seriously would not consider conquering such altitude anywhere else on foot or by ropes otherwise. Another panoramic view of the magnificent scenery around. We were surrounded by such staggering beauty that we decided to get out of our vehicle and walk up the road for the last stretch. Simply mesmerising to look at the majestic mountains, smell the fresh air, and feel the cold Himalayan wind in your face. Closing in on the snow-capped mountains. The 5-colour prayer flags flying high against the vivid blue sky, leading up a small hill. The white vertical prayer flags are erected 45 days after the death of someone to honour, guide and protect the soul on its way into the next life. Where possible, there will be as many as 108 of them - a number of significance in Buddhism. Prayer flags flying high at 3,988m. They are allowed to stand in its place until the cloth has surrendered itself to the forces of nature. Not exactly on the top of the world, but the experience and incredible views were good enough for us. This is probably how far and high we could take anyway, before any altitude discomfort. Blue, white, red, green and yellow fluttering across the mountain range as far as our eyes could see. Enjoying a cup of nice hot tea from.... Nescofe? The mobile café where we got our hot tea from. The entrepreneurial owner had even brought up a wide variety of food and souvenir. Possibly the highest café and pop-up store in Bhutan. Our driver, Mr. Sangye singing with his friend, sending beautiful voices echoing across the mountains. 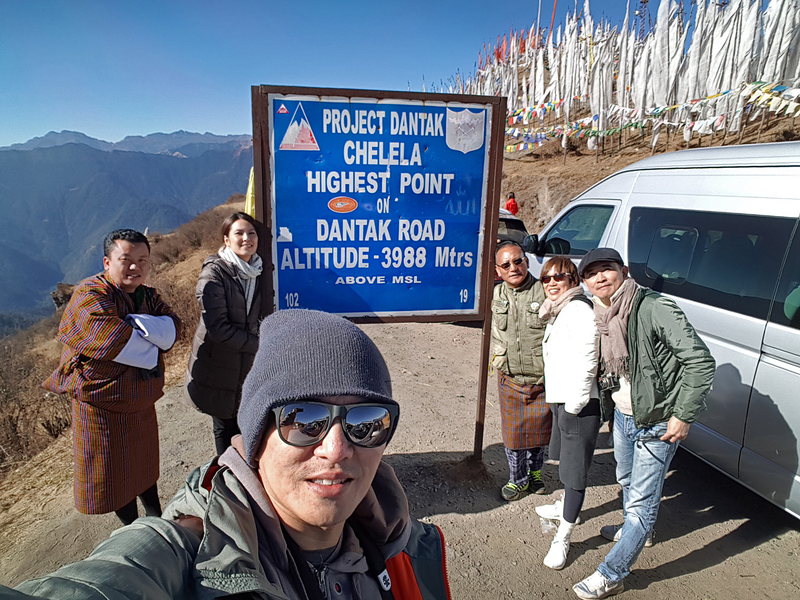 Thanks to DANTAK for building the highest road pass in the country, hence allowing us to reach such altitude with ease. Project DANTAK is a part of the Indian Army Corps of Engineers and has been responsible for the construction and maintenance of over 1,500 km of roads and bridges in Bhutan since 1961. Without saying, our visit to Chele La would not be complete without a group wefie. Moving off, we saw several yaks along the way, chilling by the roadside. Just 45 minutes from Chele La is Haa Valley. Another photo-op quick stop looking down at this peaceful valley before entering the town. And our guide, Mr. Jigme, with his favourite binocular. Our first stop in the Haa Valley was the famed Lhakhang Karpo, also called the White Temple. It is one of the two sacred temples in Haa, which are among the holiest sites in Bhutan. Black dog at White Temple. Beautiful hand-painted details at Lhakhang Karpo, with prayer wheels that go around the temple building. The main temple building of Lhakhang Karpo. Our driver, Mr. Sangye, doing his prayer wheels around the building. Lhakhang Karpo and its beautiful surrounding. The temple was established in the 7th century and went through extensive restoration and rebuilding in recent years. It was lunchtime. Wonderful Bhutanese food to satisfy our growling tummies. Women workers getting to work. Many road construction workers are women in Bhutan. After a short drive, we were dropped off along the Haa Chu river surrounded by stunning scenery. We had arrived in the town of Haa and would take a stroll into this sleepy and relatively unknown town. The first impression we got upon entering Haa was it seemed like we were thrown back in time. Everything was authentic and almost ancient. Locals scattered sparsely along the sidewalk and chatting about the day. And carefree children running along the car-free roads. Piling up enough firewood for the coming winter. Filling the quiet streets of Haa with some local music. Many "General Shops" could be seen along the main street of Haa town. Take a peek into one and you'll be fascinated by the local products on the old wooden shelves, many of which we would not have seen before in our lifetime. Locals gathered around a street vendor with a massive slab of yak remains, presumably haggling and deciding which part to get. Getting their selected meat weighed. The town of Haa is very small and peaceful with only one street and a row of traditional shophouses. After all, it was opened only in 2002 to tourists, hence retaining its beautiful authentic charm. Some locals in Haa remain quite curious yet reserved with the occasional sight of tourists in their town. Probably still not used to seeing foreigners with big cameras around. While some continue to radiate with that same brilliant Bhutanese smile at us. A group of young local girls started chatting with us along the street. I handed over my phone to one of them after this photo was taken and she started transferring it into her own smartphone with a few clicks. They are certainly good with their smartphones and social media, better than me for sure. Getting the best view of a soccer match. Cats are rare and they are mostly kept as house pets. Thrown back in time at a local hardware shop. Spotted a satyr tragopan pheasant on the roadside while travelling back to Paro. With the help of our vehicle's headlights, their gorgeous feathers of striking vermillion had made the bird luminous and cannot be missed along the windy roads. Our driver, Mr. Sangye's sharp eyes had spotted another beautiful bird along the way, and on the tree this time - the yellow-billed blue magpie. Country road, take me home... Travelling back to Paro and chasing the setting sun, with Paro Dzong on the right. The main street of Paro town, flanked by two rows of local supply stores, souvenir shops and a few new cafes. Other than being a happy bunch, Bhutanese are also known to be kind and honest. You may look for your lost items at this 'Lost & Found' box along the street. But if you were to walk into some shops, it could be bustling with life, where many locals would gather in a warm and joyous atmosphere. In love with that place's photography.